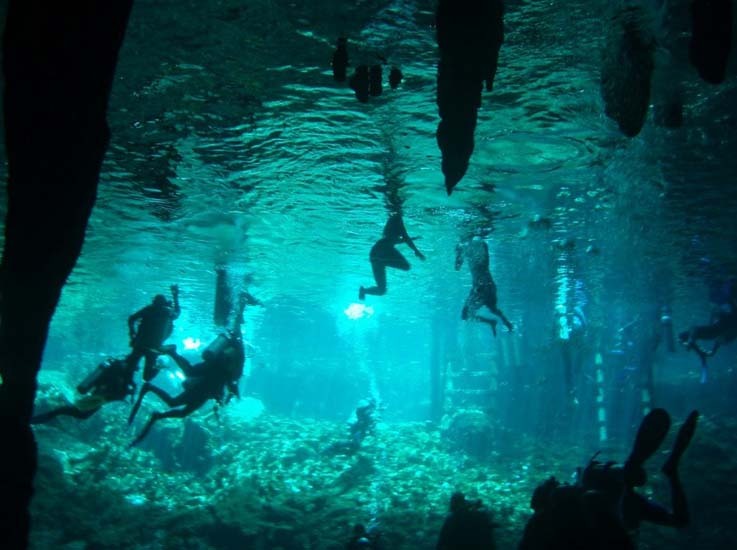 Although there are an estimated 7,000 cenotes in Mexico, swimming in one feels like an exclusive adventure. These cenotes are essentially sinkholes in the earth’s surface where rainfall has slowly eaten away at the limestone over millions of years. Some of these cenotes are completely open like a lake, almost completely closed with only a small opening, or somewhere in between. While many of them have clear fresh water, you can also find those with large blue-green algae build up, creating rich nutrients and an amazing swimming experience. Here are our picks for the best cenotes in Mexico for swimming and where to find them. Amidst the Maya Jungle and just a 15 minute drive from the Mayan pyramids at Chichen Itza is the town of Yokdzonot. 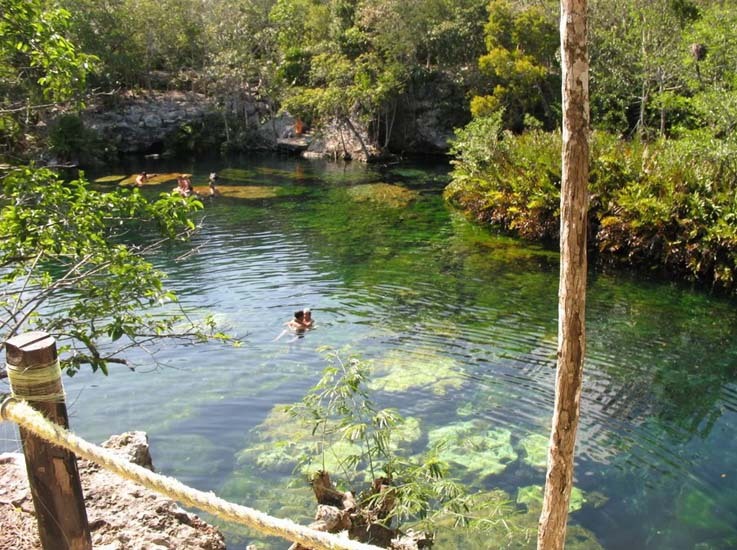 Follow the signs to the Ecological Park and you’ll find the beautiful freshwater cenote. The cenote is run by 18 local Mayan females, so ensure you take care when visiting this delicate area. The site itself is enchanting and the women who run it have set up several facilities including a restaurant, kitchen, and public bathrooms. Cost: $8 per person – includes optional life jacket and visor. 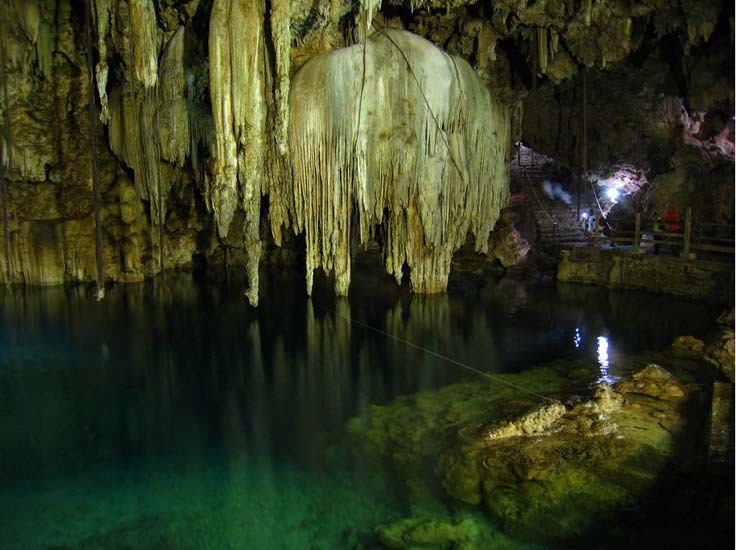 Located just 15 minutes north of Tulum off Highway 307, or a one hour drive from Cancun Airport, Cenote Dos Ojos is a flooded cave system first discovered in 1986. Although it continues to be explored today, the cave system is known to extend at least 61km, and is one of the deepest known cave passages with a depth of 118 metres. Dos Ojos, meaning ‘two eyes’, refers to the two cenotes connected by a large cavern zone. 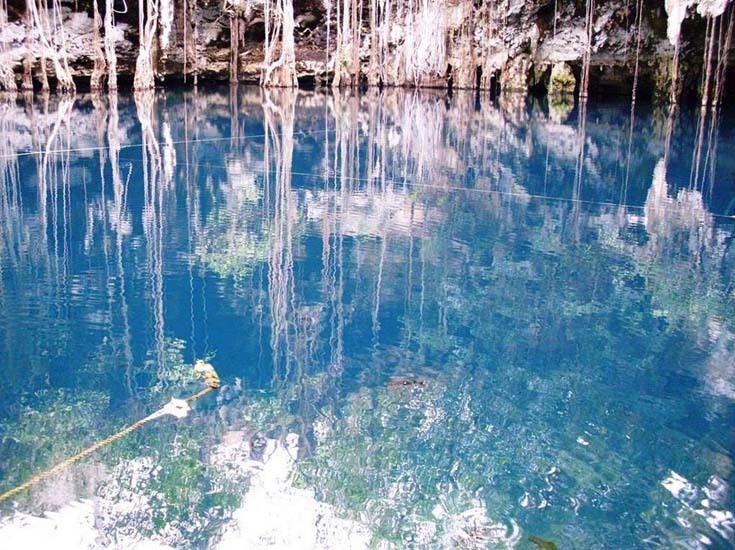 One of these cenotes is clear blue water, giving snorkelers and divers high visibility. The other, named the ‘black eye’, is virtually light-free and visitors will need a flashlight to dive here. The area is very cramped however, and isn’t for everyone. 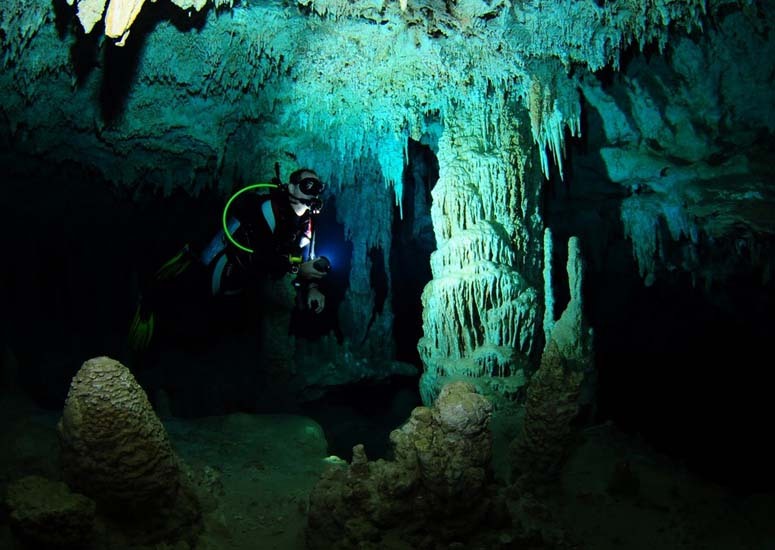 There are also dry caves which divers can surface at, including the famous bat cave. Remember to bring food with you to this cenote, as there are no restaurants on site. Cost: $5 – $10 for swimmers, snorkelers, and onlookers. Prices start at $130 for a 2 tank dive. Just off the highway between Chichen Itza and Valladolid is the beautiful secluded Cenote Azul, situated in an ecological and archaeological park. The cenote is 26 metres deep, surrounded by vegetation, and has crystal clear water perfect for swimming in. The beautiful turquoise water and marine life also make this a divers dream. If you aren’t a diver, there are still plenty of things to do here, such as jumping off the mini cliff into the water, wading through the shallow pools, or simply having a picnic in the beautiful area. 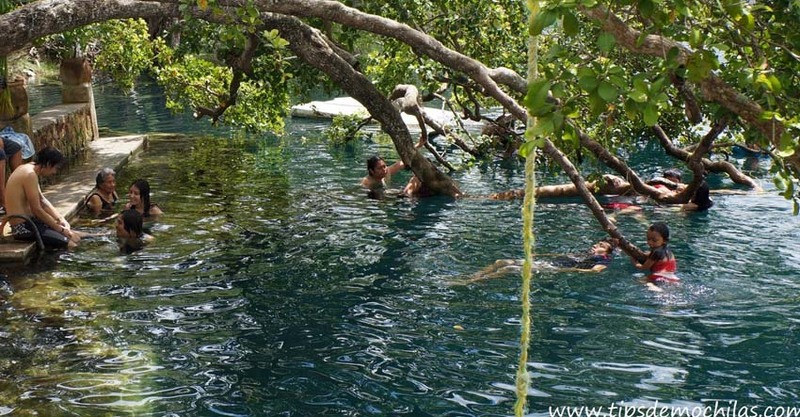 From the nearby Playa Del Carmen or Tulum, visitors can take an inexpensive minivan or taxi to reach Cenote Azul. Located in Dzitnup, this underground cenote is one of the most photographed cenotes in the Yucatan. The massive hole in the ceiling allows a huge system of roots to reach towards the water nearly 8 metres below. To access the cenote, visitors must go down a stone staircase, followed by a wooden staircase that leads to a viewing platform. From here, you can swim through the crystal clear water. A series of ropes have been set up to make it easier to cross the water, and snorkelling equipment is available to rent. A short taxi ride from Valladolid will take you to the complex that contains both Samula and its neighbour, X’Keken. For those who want to mix a little history into their holiday, Cenote Ponderosa is perfect for discovering some Mayan rituals. Also known as the Garden of Eden, this cenote was once the location of human sacrifices and the offerings of jade and gold, which were thrown into the water. The cenote is 15 metres deep, and visitors will see shimmering fish flitting in and out of underwater caves. The area is covered partly by a rocky ceiling, as if chiselled from the side of the rainforest. Visitors can jump from the rocky ledge and swim out to the sunny freshwater pond for snorkelling, or experience cavern and cave diving. Diving equipment is available to rent on site, so why not try your luck at discovering some ancient treasure. Cenote Ponderosa is located just 10 minutes south of Puerto Aventuras on Highway 307. From the turnoff, a 1 mile dirt road leads out into the jungle where the cenote is located. 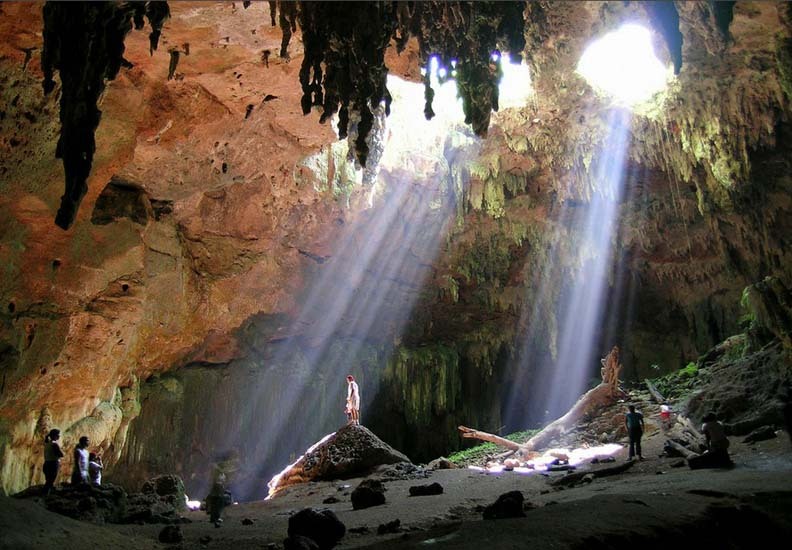 The largest and most interesting cavern on the Yucatan Peninsula, Grutas de Loltun is a treasure trove of data for archaeologists. Carbon dating has been used at this site, revealing that humans used these caves 2,200 years ago. Murals of hands, faces, and animals have been found here, but sadly not many of these remain due to people touching them. Even if you don’t like swimming or diving, Grutas de Loltun allows visitors to view the area without having to get wet. Guides lead you through a network of caverns featuring tree roots bursting through the ceiling. These intricate caves create adventure and mystery, and an unforgettable experience. For a day at one of these beautiful cenotes, you’ll need swimmers, sunscreen, water, thongs, and a towel. You may also want to pack some food, as some of the sites do not have anywhere to purchase food. Most of the sites have snorkelling equipment, changing facilities, flashlights, and anything else you might need. Photographs show a mass migration of rays in the Gulf of Mexico.